THREE times in the last few years, John Holdsworth & Co Ltd of Shaw Lodge Mills, has entered materials in the International Trade and Fabric Exhibition, an annual event held at Sacramento, California. And everything the firm has entered has won a gold medal! This remarkable 100 per cent record was maintained in the last Sacramento exposition, then three entries from Shaw Lodge Mills each got a gold - a novel hat-trick. 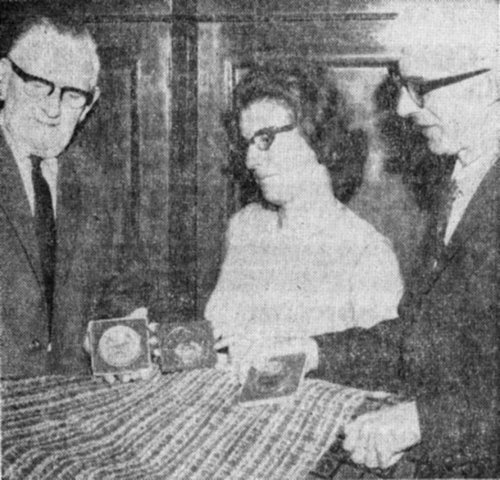 The latest medals have now arrived at the Mills and are to be set in their display cases to join the two medals won by the firm for its double entry in the 1968 show and the single medal for one entry awarded in 1960. With their glittering clutch of six golds Holdsworth directors have got the material to build up a spangled section of a display annexe that must be among the most remarkable in British textiles. One of the medals was awarded for an all-wool face velvet moquette, suitable for buses, coaches and heavy duty use in public buildings as well as for domestic contracts. The second medal came for upholstery material for furniture in the home, and the third for a flat tweed - type weave in material suitable for domestic and contract work.